As the 1970s came to a close, George Mason University found itself once again in need of a new president. Dr. Vergil H. Dykstra, Mason’s second president, left the university abruptly in April 1977. His replacement, the Vice President for Academic Affairs Robert C. Krug, declared he would only serve temporarily as acting president until a replacement could be found. The George Mason University Board of Visitors was intent upon finding a permanent replacement, one who could lead the University effectively through the anticipated admissions growth, and turn the University into a true educational force in Virginia. The Board found such a leader in Dr. George W. Johnson. Johnson was born and raised in Jamestown, North Dakota during the Great Depression. His family was too poor to send him to college, but Johnson’s academic tenacity helped him receive a full-tuition scholarship to Jamestown College, a local liberal arts school. While he excelled in college--graduating with a 4.0 grade point average--Johnson was unsure of what he wanted to do with his life. Serving in the military during the Korean War gave Johnson time to think about his future, and the G.I. Bill allowed him the opportunity to attend graduate school. Jamestown College had a strong alumni network, which helped Johnson get into Columbia University in New York City, where Johnson earned his masters and doctorate. After Columbia, Johnson studied in Heidelberg, Germany before taking jobs teaching at the University of Missouri and Rutgers University. Johnson would then go on to Temple University in 1957. At Temple, Johnson claims he became enamored with teaching. However, Johnson soon took his first foray as a university administrator when he became chairman of the English Department. Johnson would later say he never wanted that job, but felt pressured by his superiors to take it. He then advanced to Associate Dean before becoming the Dean of the College of Liberal Arts, a position Johnson held for ten years. As dean at Temple, Johnson learned many of the skills needed to be an effective college administrator. He established a budget system in which each expense was seen as a project, and the associate deans helped prioritize all the projects. To assist in his efforts to run his department efficiently, Johnson learned to use his imposing six foot six inch height and willingness to fight in order to forward his agenda. Even Johnson characterized his demeanor as brash, rebellious, and stubborn. Whether arrived at unfairly or not, Johnson earned a reputation for having an adversarial relationship with Temple University’s president and the Board of Directors, which led to many tense situations. After witnessing a number of altercations between Johnson and the Temple University Board of Directors, a friend submitted Johnson’s name for consideration for the open position of president of George Mason University in late 1977. Johnson had never heard of the school; however, a letter from the George Mason University Board of Visitors regarding his candidacy intrigued him. Johnson would later remark that the letter seemed to be written by someone unfamiliar with university administration, and he found it to have “a kind of charming freshness to it.” The Board of Visitors held the search for a new president mainly in secret, and met with Johnson the first time at Dulles International Airport in early March of 1978. On March 8 the Board put Johnson on a short list of three candidates for a final interview. During the interview process, Johnson was asked about his views of Mason’s future. “The shape of education in the future,” said Johnson, “is going to be wrought at places like Mason.” According to Johnson, this was just the type of answer the committee wanted to hear. The Board of Visitors officially offered the presidency to Johnson, who made the difficult decision to leave Temple after twenty-one years of service to move on to George Mason University. Johnson set to work immediately after his July 1, 1978 start date to shake up George Mason University. He found Mason to be, in his words, an empty slate, as it had not distinguished itself in any field: academics, research, publication, or athletics. What it did have was location—only fifteen miles from Washington DC in a community that was growing rapidly. Taking into consideration Mason’s lack of distinguishing traits and its newness, Johnson would use his mandate from the Board of Visitors to mold Mason into a major state university, but one that would be markedly different than the existing schools. Mason would not be allowed to imitate the other schools, according to Johnson, so it had to innovate, to be the prototype. One of Johnson’s earliest innovative moves was to form strong bonds between the University and the Fairfax County business community. Since its inception, the surrounding business, government, and corporate leaders have supported Mason through gifts of land and financial support, as well as participation on advisory councils and governing boards. Mason could have remained a commuter college in one of the Washington DC’s bedroom communities. However, the local business leaders had much grander plans for the area. Personal computer technology was expanding, changing how people used computers. The growth of the federal government meant a growing need for more technological and consulting support. The business community in the Northern Virginia region was already planning on filling those needs. In the future, the area businesses would demand a highly educated work force as well as top-notch research facilities. This was exactly what a university like Mason could provide, if it had the proper programs in place. Johnson immediately joined the Fairfax County Chamber of Commerce and soon became its director. He had a foot in both the business world and the world of academia, and made communication between the two worlds seamless. Many of the leaders of the Fairfax business community also served on the Mason Board of Visitors, and consequently had direct access to the decisions made at the University as well as at local governmental agencies. Because Mason was so young, it did not have the network of alumni who sponsored programs that enhanced the University’s legacy. Instead, Johnson forged a network of business leaders who sponsored the future of the University through donations and access to their businesses. Johnson called this network the George Mason Institute of Science and Technology (GMI). The formation of this organization might have started as an informal gathering of eighteen firms, however the intentions and the efforts behind it were in earnest—Johnson wanted to create an environment for innovation similar to California’s Silicon Valley and its ties to Stanford University. Here the leaders of the high tech community could put forth their ideas and needs for higher education at Mason, and Johnson could encourage the businesses to donate time, money, and personnel to train students. GMI gave these leaders a perfect umbrella under which to meet and plan the future. By Johnson’s estimate, the GMI was responsible for raising six million dollars from 1978 to 1986. Eventually, GMI was superseded by Northern Virginia Technology Council in 1993, and is today one of the leading forces of growth in Northern Virginia, with over 1,100 member firms. The Center for Innovative Technology (CIT) in Herndon, which provides funds and facilities for high tech partnerships, was also an offshoot of Johnson’s efforts to marry the innovative potential at Mason with the entrepreneurial drive of the Northern Virginia area. The 123 Club, another Johnson-initiated business/university organization, was not an official structure, but instead an informal gathering of movers and shakers. Additionally, there was significant membership and activity overlap between this group and GMI. However, the 123 Club was formed, not only to improve the community, but also to work on the challenges faced by the Northern Virginia region when dealing with the Commonwealth of Virginia. Early on, they met over dinner at the University President’s residence to hammer out strategies in which the University could aid local business, and visa versa. Johnson had noted the animosity between Northern Virginia and the rest of the state—an animosity he surmised was aggravated by the rise of the new economic realities of high tech, information, and international business relationships in Northern Virginia that were quickly supplanting the fading economic fortunes of tobacco, ironworks, paper mills, and shipyards that had previously ruled the commonwealth. Resentment also came from older political fights where some “down-staters” characterized the Northerners as Federal sympathizers and “carpet-baggers” who pushed against long-passed Virginia traditions such as segregated schools. The 123 Club, named after the main highway through Fairfax County at that time, was meant as a subtle mockery of Richmond’s Main Street Club, the capitol’s organization of influential business interests. The fights the 123 Club won in Richmond affected how Northern Virginia and George Mason would grow in the future. The usefulness of Johnson’s university/ business cooperation became readily apparent in the first battles he faced with the State Council of Higher Education for Virginia (SCHEV) over Mason’s acquiring of a law school and becoming a doctoral-degree granting institution. These were not fights Johnson had started, but he saw these steps as critical to his attempts to mold Mason into a pre-eminent university. The business community agreed, and aided him in the fight through lobbying efforts. The story of this fight is covered in detail in two other essays in this exhibit: “Before We Became Part of the Mason Family,” and “The Law School Battle… and Triumph.” Aiding the forces supporting George Mason University in Richmond was J. 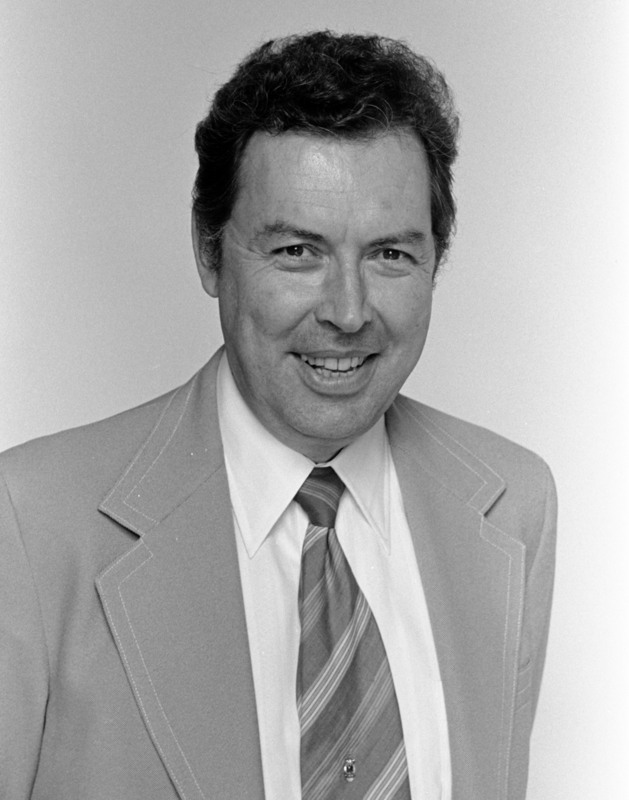 Wade Gilley, who was the Virginia Secretary of Education from 1978-1982. After his term was over, Gilley joined the Johnson administration at Mason as Senior Vice President for Facilities, and supervised the explosive growth of the Mason campus until 1991. Not all of Johnson’s initiatives to grow George Mason University came about as results of the interplay of business and academia, although Johnson did depend on community support for some of them. Johnson had wanted to shake up the established traditions of education during his time at Temple University, and he saw his opportunity to experiment with some ideas at Mason. The initiatives took three forms: one was to change the structure of the disciplines, the second was to grow the facilities, and the third was to reform how teaching was done directly. The first two efforts included the formation of multiple institutes and new buildings, and the third created new educational programs. True to Johnson’s form, each proved to be innovative in its own right. Given the Board of Visitors’ mandate to turn Mason into a major state university, Johnson had to find ways to grow the university quickly, but still strive toward high academic standards. He knew he did not have the decades it generally took to establish full programs in science, social studies, or humanities. Johnson instead chose the more expedient but piecemeal method of attracting or creating institutes and anchoring them to the central university. In this way, George Mason became the home of the Institute for Conflict Analysis, the Center for the Study of Public Choice, the Institute for Public Policy, and the Krasnow Institute for Advanced Studies. Each of these programs are detailed in later essays in this exhibit. The growth in the student population meant that Mason needed new buildings to hold the ever-increasing student body. For some time, the overflow was contained in mobile classrooms. However, Johnson wanted permanent new facilities that would not only grow with the number of enrollments, but also enrich the students and the general regional population, too. He saw sports and the arts as two ways the University could interact with the community. To that end, Johnson lobbied the state legislature and the local community to build two much-needed facilities: the Patriot Center and the Center for the Arts. These two buildings provided state-of-the-art medium-sized venues for sports, the performing arts, and community events such as high school graduations and political rallies. In addition to these buildings, Johnson added major additions to the Arlington Campus and the Fairfax Campus, including the building that would eventually bear his name: the Johnson Center. Essays in this exhibit flesh out the struggles to get these major expenditures through the Commonwealth and to get them built. Johnson’s third initiative to turn Mason into a prototypical university was to change how the curriculum was organized and teaching was done. Even though George Mason University itself was only seven years old in 1979, Johnson observed that many of the faculty were hold-overs from the days when Mason was still a branch college of the University of Virginia. Johnson railed against what he called a “restive” faculty, and complained that he was in charge of a local university that could have national significance, but that his “Harvard aspirations” were coming up against a “community college attitude.” Johnson perceived what he described as an “inappropriate, inherited UVA culture,” and that many of these “UVA people” might have distrusted him since they had not seen such an assertive president at the University of Virginia. To get his innovations injected into the classical educational system, Johnson created and sponsored a group of “wedge programs” that emphasized inter-disciplinary learning. Johnson was an early champion of the inter-disciplinary approach to education—allowing students to learn the same information from multiple specialties. The Plan for Alternative General Education (PAGE), the New Century College (NCC), and the Honors College were all experimental wedge programs that brought interdisciplinary study to Mason, and their rise is detailed in a later essay in this exhibit. The changes in the curriculum and the organization of degree programs helped Mason to develop the wider scope of classes that characterize a “university” in all the senses of this word. One of Johnson’s many enduring legacies to Mason was his innovation of the Robinson Professor Program. His goal was to help community leader Clarence Robinson fulfill his desire to see undergraduate education at Mason achieve the highest possible caliber. Robinson did not want his generous donation to the University go for bricks and mortar, but instead wanted to encourage increased enrollment by bringing in great teachers. Against the opposition of some faculty members, who wanted the money to go to the entire faculty, Johnson instead created a program focused on bringing fifteen outstanding instructors to teach only undergraduates. The essay “A Dedication to the Teaching of Undergraduates” outlines the entire program. Throughout his tenure, Johnson continued to enjoy the same unwavering support from the Board of Visitors as he had received upon his initial ascension to Mason’s presidency in 1978. Johnson claims that this support encouraged him to postpone his retirement by three years. Ultimately, in 1994, newly elected Governor George Allen changed the composition of the Board in ways that made Johnson’s relationship with the University’s governing body increasingly difficult. While Johnson said he probably could have stayed on longer, he announced his impending retirement in August 1995. Johnson retired at the end of the 1996 school year and was succeeded by Dr. Alan G. Merten. Johnson’s legacy still lives on at George Mason University. The building which has become the center of campus, both literally and figuratively, bears his name. The innovative programs begun under him continue to be highlights of Mason’s success. Having earned the distinction of being the university’s longest serving president, George Johnson’s influence both within the institution and outside it have had a strong bearing upon what George Mason University is today. George W. Johnson, Oral History Interview Part 1, 2005. George Johnson, “Biographical Sketch, 1979,” George Mason University Office of the President records, Collection #R0019, Special Collections and Archives, George Mason University. Box 78, Folder 6. Russ Banham, The Fight for Fairfax, (Fairfax, VA: George Mason University Press, 2008), 183. Broadside, Volume 21, Number 9, April 3, 1978. Liza Bercovici, “The Study Merchants,” The Washington Post, November 12, 1978, pg. C1. The consultants became known as the “Beltway Bandits,” and were lambasted by the Carter Administration. J. Wade Gilley, “ Biography, “ on the website http://www.wadegilley.com/ , Accessed August 14, 2012. Lloyd Griffiths, Oral History Interview, Part 1, 2012. Johnson Oral History Part one. Johnson Oral History, Part one. Johnson, Oral History Interview Part 1, 2005.